This is something we all should have gotten into, if it hadn't seemed so goofy at the time. If only someone would have told us, that chicks dig this kind of thing . . . I handled Khap, a gyrkin, as a 3-degree and as a 2-degree. We also had a couple of gray gyrkins (they also come black and white, depending on latitude) that we weren't allowed to fly because they were confiscated evidence. 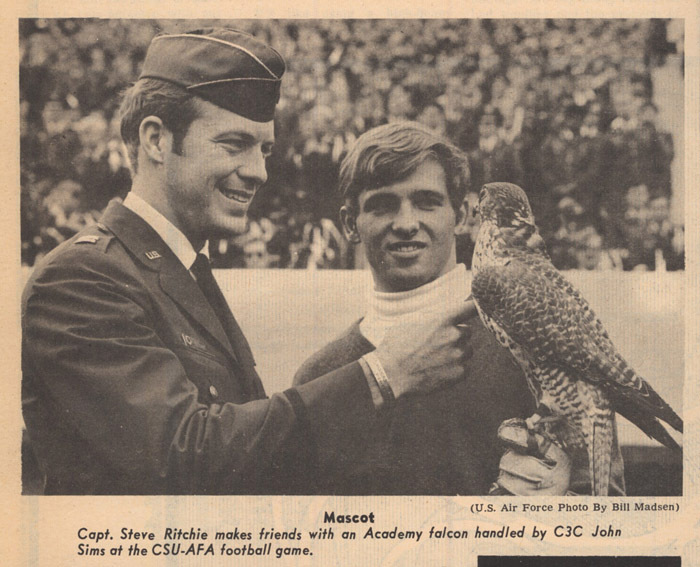 Once the legal case fell through, another guy got to fly Khap at a game, my Firstie year. Summit, a tiercel, was the team star. Temujin, a tiercel I also handled, was one we had successfully bred (a first in history). "Gyrkin" is a male, and the female is called “gyrfalcon”. "Tiercel" (as opposed to "falcon") also indicates a male. It means "one third smaller" which the males are. 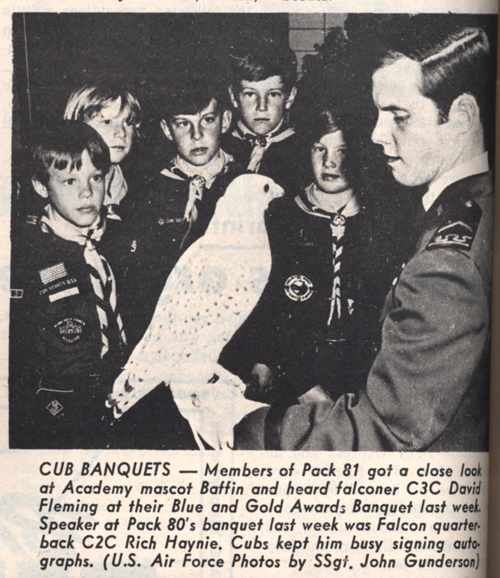 I was one of the four class falconers – and was the one that flew Summit in NY's Central Park for the TV stations. I also lost Summit at Annapolis before the Navy game. He was caught by the police the next week and the Navy flew him to Peterson Field in an A-6. Made the front page of the paper . . .
Not sure I 'remember' all that Johnny and John say; but I do recall Summit "wandering off" on more than one occasion. Each class did have 4 guys but, like John Howard, I don't remember a 4th in our group. I think we may have only had 3 come to think of it. Many memories and many years ago . . . all good fun, and Doc Mac was a wonderful human being and mentor. Am sure John and Johnny would agree.